WINCHESTER, Mass. (October 29, 2017) – “Collegiate Fight Night”, presented by the National Collegiate Boxing Association (NCBA) in association with USA Boxing, on Saturday night (7 p.m. ET start), November 11, will be a homecoming for a pair of West Point Cadets boxers with close ties to the town of Winchester (MA), Luca LoConte Botis and Jack Ward. Ten amateur bouts are on tap at Maurer Auditorium in Winchester Town Hall (on Mt. Vernon St.) as the Cadets of the United States Military Academy at West Point are matched against a New England all-star caliber team comprised of boxers from the Coast Guard Academy (New London, CT), University of Massachusetts, University of Connecticut, Trinity College and Harvard University. 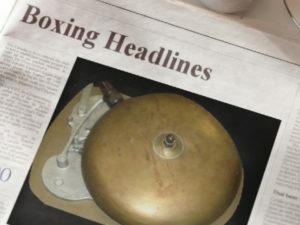 West Point requires all its Cadets, male and female, to take 19 lessons of boxing and that, combined with the program’s tremendous success in competition over the years, results in its relatively high number of boxers (40) on a college boxing team. West Point voluntary head boxing coach Ray Barone is a military retiree who taught at West Point. “Luca and Jack work hard in the gym and are leaders amongst their peers,” Coach Barone said. “They are top-of-the-line guys and we’re fortunate to have both on our team. West Point is a high-end academic school, like an Ivy League school, and we aren’t allowed to recruit boxers. LoConte Botis and Ward, who has close to a 4.0 GPA, are sophomores who aspire to be Infantry officers upon graduation from West Point. Luca attended West Point Prep School for one year before entering West Point Military Academy. A 2015 graduate of Winchester High School, he started boxing at a young age, capturing top honors in the New England Junior Olympics, and he developed his skills at Peter Welch’s Gym in South Boston, as well as with the Rivera brothers at the Somerville Boxing Club. “I am from Winchester and look at this show as a homecoming,” Luca remarked. “I fought there once as a freshman and now I want to show everybody at home that I’ve grown. I’m no longer a boy, I’m growing into a man, and boxing has a lot to do with that. Styles make fights and I know who I’m fighting. I plan to relax in the ring and give everybody a real show. I’m going to have a lot of fun, too, and leave with a smile on my face. Ward grew-up in Hampton, NH, but he has roots in Winchester, which he considers his second home. Jack attended Salisbury School, in Connecticut, and he was recruited as a football player. He decided not to play football at West Point and, despite having no prior experience as a boxer, he joined the West Point Boxing Team after meeting Coach Barone and some members of the squad. “I love competing, discipline and conditioning and I’ve never been in as good shape as I am now as a boxer,” Jack explained. “Boxing adds to my overall development, mentally and physically, and the it will help me become a more effective leader: Calm under pressure, in and out of the ring. Former professional world champions “Irish” Micky Ward (Lowell) – no relations to Jack Ward — and Jose Antonio “El Gallo” Rivera (Worcester) will be special guests at “Collegiate Fight Night”. 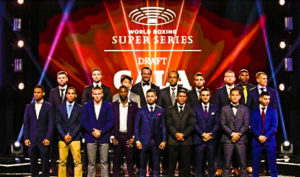 ABOUT NATIONAL COLLEGIATE BOXING ASSOCIATION (NCBA): The NCBA is the senior college boxing governing in the United States. The NCBA provides student athletes an opportunity to box at the recreational, intramural, and competitive levels. Its philosophy and rules provide a safe and level playing field for both new and experienced athletes.